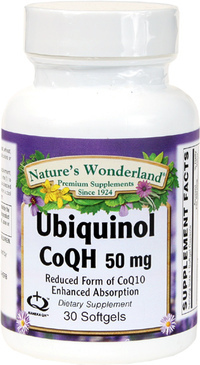 Ubiquinol CoQH 50 mg, 30 Softgels (Nature's Wonderland) - Penn Herb Co. Ltd.
Ubiquinol provides superior defense against oxidative damage to the body's cells, and plays an essential role in the body's energy production. Why you need Ubiquinol? Age and health status significantly affect the body’s ability to manufacture ubiquinol from the ubiquinone form of CoQ10. Providing an oral supplement of this powerful antioxidant can help the body maintain optimal levels despite age and/or health status. What's the difference between CoQ10 & Ubiquinol? Ubiquinol is the antioxidant form of CoQ10. Studies show this form of CoQ10 is absorbed more efficiently and offers enhanced bioavailability over other forms of CoQ10 (ubiquinone). Pre-converted, absorbable form of coenzyme Q10 supports increased energy, stamina and vitality, especially for those over 40; supports cardiovascular health (CoQ10 is concentrated in the heart). As a dietary supplement, adults take 1 softgel capsule, 1-3 times daily with meals or as directed by a health care professional.